I’ve become a bit of a lipstick junkie. I’m now always looking for a new fix, whether it’s a new colour, a new finish or a new brand to try. I have two to report on today. One red, my failsafe, and one pink, a little outta my comfort zone. Let’s start with the pink shall we. I’ve always been after an in-your-face pink but never really thought I could pull it off. 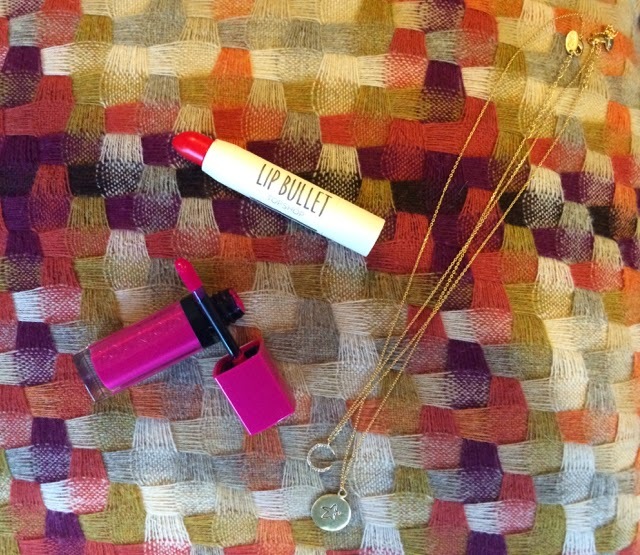 However, when I saw Bourjois Rouge Edition Velvet Lipstick in Pink Pong, I immediately chucked it in my basket. The packaging is super small making it perfect to cart around and it has a cute little doe-foot applicator to match. It glides on like velvet, is easy to layer and has the best staying power. I ate, I drank and it didn’t budge once. My only problem was the eventual drying and cracking as my lips have taken a bit of a beating this winter. And now for the red. It’s a Topshop Lip Bullet in Joyride. Normally, when I reach for a lippy, it’s a red. It’s my safe option. I have pale skin and freckles and know that I can work a red. This one might just be my new favourite shade. It looks super bright in the bullet, but on me is just a little shy of bold red maybe more rose, which is totally ok. It’s creamy to apply and has a satiny finish. My only issue was staying power, it’s not the best. Having said that, it is easy to touch up, with the pencil-like nature of the lipstick making it a quick to apply on the run. Can I also take a moment to point out my new necklaces above. I blogged about this moon and stars pairing back in November as a Want it on Wednesday item, as stars have a real sentimental meaning to me, and my mum was kind enough to gift it to me. It means the world to me and is a constant reminder of the gorgeous people who I’ve lost but still carry with me. Thanks mum. Got any lipstick recommendations for me, leave it below.